Such a classic. I could honestly eat soup every day...seriously. Maybe this has to do with the fact that I'm cold 99% of the time, but hey, I don't care the reason. I just know that I love it! French Onion Soup is such a classic and sophisticated soup. Don't you think so? It's fancy - that's what I think. As much as I love this kind of soup, I had never made it before. Check it off the list now! My amazing husband got accepted to Stanford for graduate school, so I wanted to make him a celebratory meal. This soup and a bottle of wine did the trick. It's actually very easy to prepare. One part of the recipe is not so fun: slicing the onions. My eyes burnt like crazy. At times, I didn't know if I would make it! It was worth it in the end - we enjoyed it immensely! In a large pot over medium heat, saute the onions with the oil, butter and large pinch of salt until tender and golden. Don't stir too often, as you want the onions to caramelize. Sprinkle flour on the onions; allow flour to brown. Add wine and bring to a boil. Add thyme and reduce heat to low. Add broth. Cover and let simmer for 20 minutes. Add salt and pepper to taste. Prepare broiler. Ladle soup into ovenproof bowls. 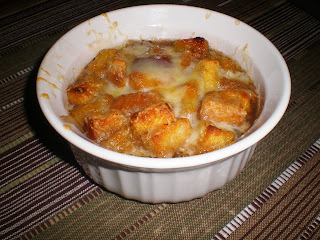 Top with croutons and then grated cheese. Make sure that the cheese fully covers the croutons, so they don't burn. Place bowls on a foil-lined baking sheet. Broil for about 4 minutes - until the cheese is bubbly and starting to brown. This looks so good. My husband and I were just discussing making french onion soup the other day!